What to do if you drill through a lead gas pipe! 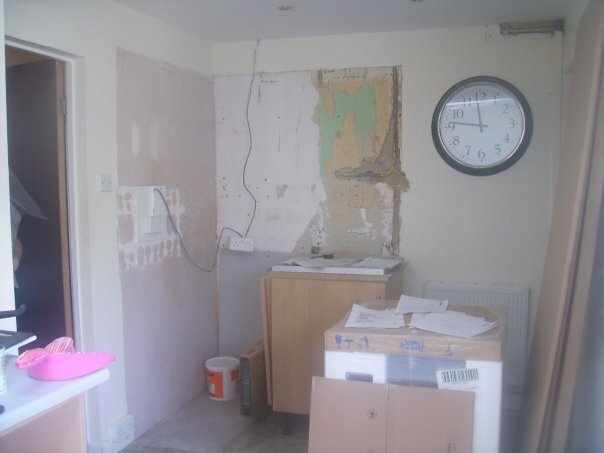 Being a bit of a DIY nut and also ever keen to save money, the year before last my husband and I decided that we would install our new kitchen ourselves. It all looked quite straight forward, the kitchen that was there wasn’t great and was pretty easy to dismantle (we later sold it on eBay for about £50!) and the new kitchen came from Ikea and actually did end up being pretty easy to assemble and install. I know – this sounds like a fairly rookie error! Firstly, if you put plaster board up, use adhesive rather that screwing it, it’s much easier and can help to avoid these problems. Secondly, all of our gas appliances were situated over the other side of the house so we had no reason to suspect that gas pipes would be on that side of the house. However, the pipe that we drilled through was part of the old gas supply and probably went to an old storage heater or something so never assume that the wall is clear, always check for pipes and cables! Ok so obviously the first thing was to turn the gas off and call the gas board. They came and inspected the situation and we were told that because we were dealing with an old lead pipe (which no longer conformed with regulations), it was ‘illegal’ for them to repair the damage. What followed was phone calls to Corgi registered plumbers and most of them told us a very similar story. Repairing a lead pipe requires skills which aren’t used very much these days (they need to be ‘wiped’) so a lot of plumbers are reluctant to do it – however phone around. You’ll be better off looking for an ‘old-school’ plumber as they are more likely to have the right experience. You’ll get a lot of excuses (including people who will tell you that you need your whole system ripped out and replaced) but stick with it – there are plumbers out there who will repair the problem. In the end we did find a plumber who was able to come out and repair the pipe. We also had the pipe capped off because it wasn’t leading to any appliances. I would say if you do have lead pipes in your property, it is worth thinking about having them completely disconnected as over time lead can become porous and that’s not really a quality that you want in a gas pipe. Finally we did manage to get the plaster board up (using adhesive!) and I plastered the wall so it’s all as good as new but it set us back a fair bit of money in plumbers bills, it was an extra bit of work on top of the already daunting task of installing our kitchen and we were without gas for a few days so the moral of the story is now that no matter where we are drilling, we *always* check for pipes!